The primary (baby) and permanent teeth typically follow an orderly pattern as they come into the mouth. Occasionally, that pattern is disrupted. When teeth do not erupt on their own, the orthodontist and periodontist work together to help move these teeth into their proper position. Each tooth will need to be evaluated on an individual basis and then a treatment plan will be developed. Typical treatment involves the orthodontist putting braces on the teeth and creating a space to which the impacted tooth will erupt. If the “baby”/primary tooth is still in place, it will be maintained until the proper space is created for the permanent impacted tooth. The maxillary canine (eye-tooth) is the 2nd most common impacted tooth (1st is 3rd molars) with an incidence ranging from 1% to 2.5%. Canine teeth are 2 times more likely to be palatally (roof of the mouth) impacted versus buccally (towards the outside) impacted. Impacted teeth are usually diverted or angled and once the roots of these teeth have fully formed, they lose their potential to erupt. Maxillary (upper) canines have the longest distance to travel from their point of formation to their final position and also have the longest period of development. Normally, the canine (“eye-teeth”) are the last front teeth to erupt into the mouth and this usually occurs by age 13. If the tooth remains unerupted, the orthodontist and periodontist will work together to develop a plan to help aid and guide the eruption of the tooth. In particular, palatally (roof of the mouth) impacted canines rarely erupt without surgical intervention. Prior to exposure of the tooth, a clinical and radiographic examination will take place to determine the exact position of the tooth and whether it is impacted palatally (roof of the mouth) or buccally (area closer to the lip). 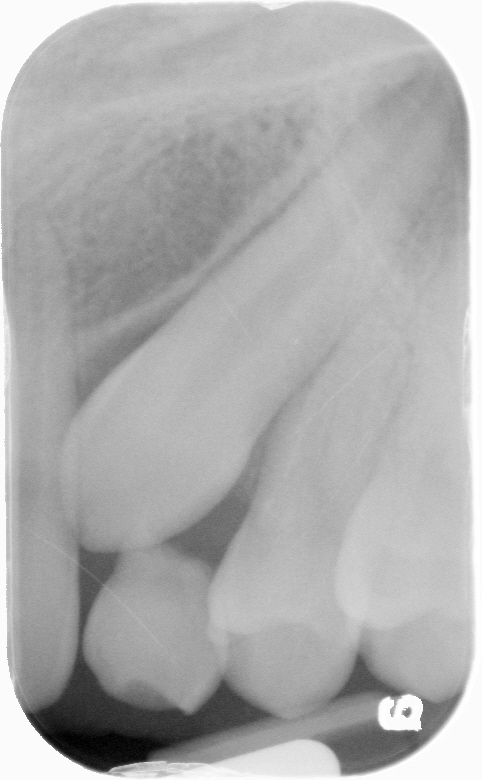 The periodontist will palpate to determine if the tooth is able to be located, as well as take necessary x-rays and/or a 3D scan called cone beam computerized tomography (CBCT) to adequate locate the tooth and determine which surgical technique will be utilized to expose the tooth. In a simple surgical procedure performed in the periodontist’s office, the gum tissue over the impacted tooth will be lifted to expose the tooth allowing for a bracket to be placed on the tooth. The bracket has a small chain attached to it that will be guided to the arch wire with a temporary attachment. In some cases, thicker tissue is added at the time of the uncovering to prevent future gum recession. 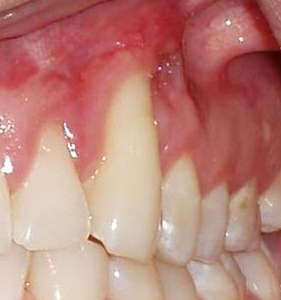 It is important that adequate gum tissue (keratinized gingiva) is surrounding erupting teeth. If this type of gum tissue is not properly positioned during the exposure procedure, the tooth may erupt through thin tissue that predisposes the tooth to future recession. inflammed with a lack of thick tissue. allowing for the tooth to erupt into a stable environment. Gum grafting is indicated. Gum grafting is NOT indicated. 1 to 2 weeks after the exposure procedure, the patient will return to the orthodontist for activation of tooth movement. The gum tissue around the erupting tooth will be continually monitored by the periodontist. The periodontist may need to rebuild the gum tissue with gum grafting if adequate keratinized (thick) gum tissue was not positioned around the tooth during the eruption procedure or did not properly develop during the eruption process. The principles described above can be adapted for any unerupted tooth, however, the maxillary canines are the most commonly affected tooth. Cooke J, Wang H. Canine Impactions: Incidence and Management. Int J Perio & Restor Dent. 2006; 26 (5): 483-491. Kokich VG. Surgical and orthodontic management of impacted maxillary canines. Am J Orthod Dentofacial Orthop. 2004; 126: 278-283. Kokich VG. 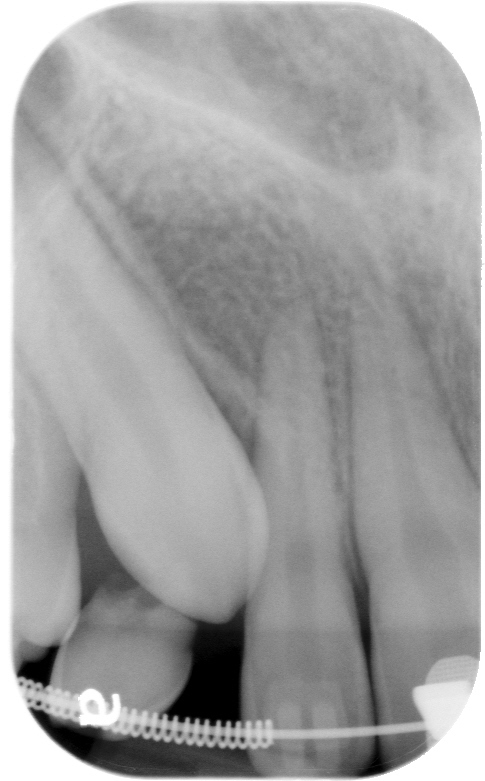 Preorthodontic Uncovering and Autonomous Eruption of Palatally Impacted Maxillary Canines. Semin Orthod. 2010; 16: 205-211. Vanarsdall RL. Efficient Management of Unerupted Teeth: A Time-tested treatment modality. Semin Orthod. 2010; 16: 212-221. Vanarsdall RL. Soft-tissue management of labially positioned unerupted teeth. AJODO. 2004; 125: 284-293.